Associate Professor Akira Utsugi from the Graduate School of Languages and Cultures, Nagoya University, Associate Professor Yutaka Sato from University of Tokushima, and their coworkers1 have discovered differences in language processing systems between native speakers of Standard Japanese and native speakers of "accentless" dialects. Their paper was published in Brain and Language on October 16, 2013. The left hemisphere of the brain dominates language processing for the difference in sounds like 'a' and 'i', whereas both hemispheres are involved in processing prosodic information, like pitch accent. Research on the influence of language acquisition on language processing in the brain has mainly studied the differences between native and second languages and has not delved into the influence of dialects within the same language. 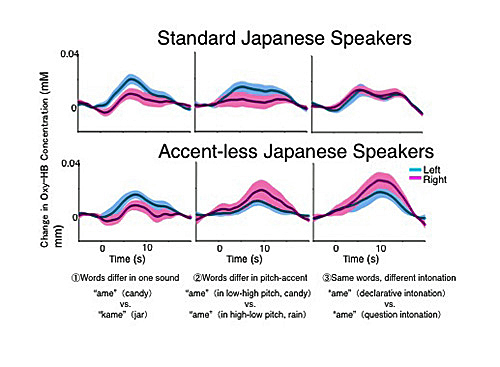 Prof. Utsugi's research group investigated how differences in dialects influence the role sharing of linguistic processing in the left and right hemispheres. 14 people whose first language is Standard Japanese and 13 people who spoke a Japanese accentless dialect participated in the experiment, and their brain response to various speech inflections was analyzed. 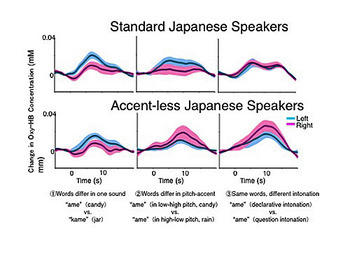 When participants listened to two Japanese words whose meaning differed based on how the accent was applied, e.g., Ame: rain and Ame: candy, the left hemisphere dominated language processing in the standard Japanese group, whereas both hemispheres worked analogously in the accentless dialect group. The results show that the differences in native dialects within the same language can change the division of linguistic tasks between the left and right hemispheres. The outcome of this research is expected to contribute widely to a deeper understanding of the relationship between the brain and language development, and to be applied to education and medical care. 1. Associate Professor Masatoshi Koizumi (Tohoku University), Dr. Naoto Yamane (RIKEN), and Professor Reiko Mazuka, team leader (RIKEN). 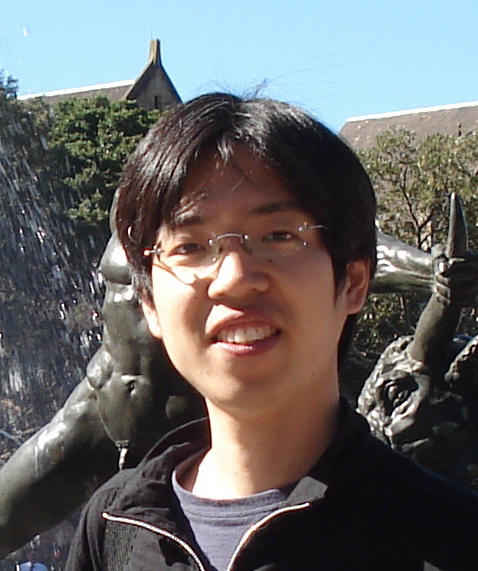 Prof. Utsugi researches phonetics in Japanese and Korean languages. He became interested in the Korean alphabet in junior high school and has been studying Korean ever since. He also studied in South Korea as an exchange student. After completing his Ph.D., he conducted research in South Korea, Edinburgh, and Japan and has enjoyed collaborating with researchers, regardless of their disciplines, at a variety of research institutes in various countries. Prof. Utsugi is making his mark in Japan and in the world. "I played a role in the above research as a research fellow at RIKEN. The research was derived from a collaboration between researchers in psycholinguistics and brain science and me with my phonetics background. The keyword in this research, 'dialect', is in fact, an important topic in sociolinguistics. I am trying to connect psycholinguistics and sociolinguistics and I am constantly on the lookout for new orientations in research and assimilating methodologies of phonetics and brain science." "When I was younger, I found it hard to use foreign languages, and foreign countries seemed distant and far away. I first visited a foreign land, South Korea, when I was 19 years old and I visited an English-speaking country for the first time when I was 29 years old. Since childhood, I have believed that I was a liberal arts-oriented person, and so I attended a school of the humanities. I never expected to take part in such a research or collaborating with scientists of various backgrounds. Everything is an experience. From diverse experience, you can make unexpected discoveries."